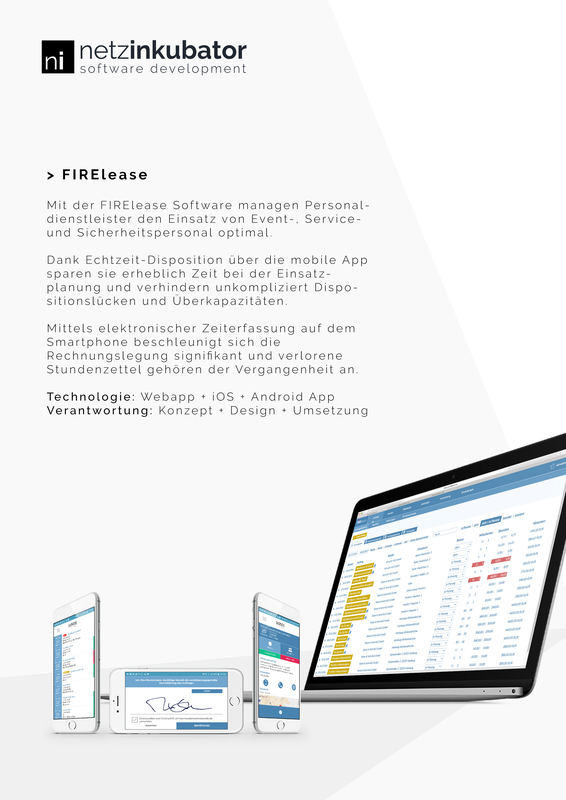 With the FIRElease software, security service providers manage the deployment of security personnel. Thanks to real-time disposition via the mobile app, they save considerable time in resource planning and easily prevent scheduling gaps and overcapacities. By means of electronic time recording on the smartphone, the accounting significantly accelerates and lost time sheets are a thing of the past. Netzinkubator Software GmbH has been developing mobile apps and web-based software for companies in Germany and around the world since 2009. A second branch of Netzinkubator Software GmbH is the distribution of its own software products under various brands. This includes the FIRElease Personnel Disposal Software.